We need more than firebreaks and vegetation clearance. For wildfire protection and suppression, we need a comprehensive external firewall system devoted to protect a community of homes, not just one property, which system may include features like a subterranean heat sink, horizontal heat flue, superior sprinkler system with robotic nozzles, automatic emergency notification, firebrand screens, and more. Our traditional methods are no match for increased winds and heat driven by climate change. A simple 6-ft wall will only serve as a convenient lever for wind-driven wildfires to catapult the flames, heat and firebrands into the interior. Gated communities without comprehensive external firewalls offer little protection against the greatest hazards in hillside communities. Developers and architects should be held to a higher standard in areas with histories of wildfires. Wildfire safety standards for California wildland urban interface (WUI) developments need to be updated. CAL-Fire wake up! A WUI perimeter external firewall system may hopefully be on the drawing boards by urban planners today, especially when rebuilding our scorched earth neighborhoods from previous seasons. It’s time to invest in our wildfire safety infrastructure. If not now, when are we going to learn? To put a damper on Diablo winds and Santa Ana winds, we can also synergistically repurpose wind turbines with strategic location patterns and adding screens and water sprays to hinder the passage of firebrands. The times, they are a’changin. Don’t let the recent cold snap fool you. The winds, they are a’comin. Although most urban developments in WUI areas are protected from wildfires to some degree by firebreaks in nearby wildlands and a defensible space of 100 feet or more in developed lots, as well as noncombustible barriers or walls protecting some residential lots, an external firewall structure in or near the WUI perimeter is absent from the scene. Here, we explore the idea of a comprehensive firewall system devoted to protect a community of homes, not just one property, which system may include features like a subterranean heat sink, horizontal heat flue, superior sprinkler system, automatic emergency notification, firebrand screens, and more. What happens when an irresistible wildfire force comes up against an Unsurmountable Firewall? The term ‘firewall’ is sometimes used to describe a firebreak in the wildlands. Now, we beg the question of whether an actual firewall structure offers added safety beyond that provided by an area simply cleared of vegetation. Does a firebreak adorned by a real firewall offer more protection than the firebreak by itself? If so, what specific dimensions, designs, features and enhancements may be critical to improving the potential fire protection promised? By reducing risks, will insurance rates be reduced? By reducing risks, will the costs spent on firefighting and ecological losses also be reduced, not to mention the horrible loss of lives, as well. A new climate change assessment for California published in late August, 2018 says that the average area burned by wildfires will increase 77 percent by 2100, and the frequency of extreme wildfires—those that burn more than 25,000 acres—will increase by nearly 50 percent under a scenario with high global greenhouse gas emissions. No relief in climate extremes anticipated in the near future. Nationwide, between 1980 and 2016 the numbers of acres burned per year has nearly doubled. In 2017, there were 71,499 wildfires, compared to 65,575 wildfires in the same period in 2016, according to the National Interagency Fire Center. About 10 million acres were burned in the 2017 period, compared with 5.4 million in 2016. 2017 acres burned were higher than the 10-year average. 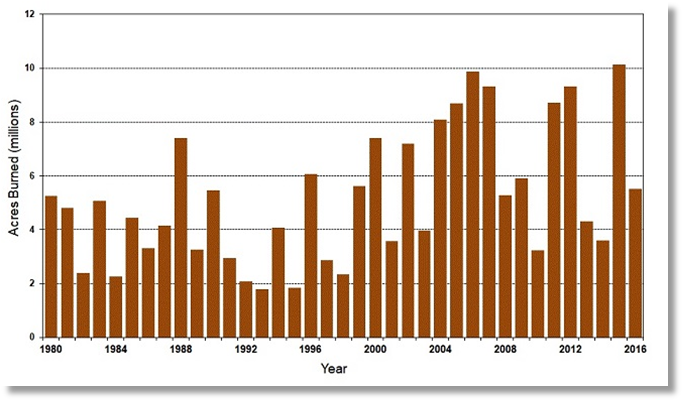 The trend of increasing acres burned nationally over the recent decades is also predicted to increase much like the grim forecast for California. A study published by NRDC in 2014 indicates that “Climate change could take a serious toll on the U.S. economy by expanding by 50 percent the area that wildfires burn —and raising projected damages by tens of billions of dollars a year by 2050.” Since the number of actual fires has remained generally constant in recent decades, it appears that increasing heat and wind tend to outmatch the resources and technology currently applied to suppress wildfires. In the west, the mountainous terrain surrounding desert plains tends to magnify the heat even more and create dynamic waves of sunbaked gales. We entertain and invite the important role of organizations like the NFPA and the US Forest Service, as well as those institutions involved in fire science research or responsible for urban planning and building codes to take part in testing the technology and formulating guidelines and codes to enable the added safety measures potentially offered by a WUI perimeter external firewall system (WUI-PEFS). Exactly where any external firewall system should be constructed is a critical question. Due to scarce resources and the benefit of timely solutions, an efficient plan may center around strategic areas, at the perimeter of a WUI area in the wildlands, which areas are designated as high fire risk or very high fire risk. This perimeter should be a narrowly defined area that is adjacent to vulnerable developed lots, but external to the lots themselves in most cases. Where might such a wall most effectively and efficiently be placed to offer the optimal protection for the urban area behind the wall in terms of topography and geology? The right-of-way and ownership of the area is also a consideration, as well as who is going to pay for it. Planning for such may be required with updated standards and regional building codes for those areas designated as wildfire high risk zones. Outside of WUI areas, some mountain crests, valleys and plains that seasonally create violent heat and wind storms with the propensity to threaten WUI developments, or serve as radial conduits along a sometimes very lengthy route, may be targeted for more preemptive tactics that include repurposed wind turbines as well as integrated external firewalls. Some WUI areas may warrant more protection in different ways than others. There may also be particular developments that need protection but are not situated in locations where wall structures are practical or even feasible based on the topography or housing density, for example. A few cabins scattered in mountain resorts here and there may be very costly to protect for the amount of property at risk. A minimal threshold of developed assets density may need to be deployed in order to move the agenda. Consider some communities who may simply refuse to mar their view of the wildlands with a large concrete wall, despite the potential safety benefits. Ecology and natural environs are the principal attraction for many people who have chosen to live in or near the mountains or other wildlands areas. Others may simply find their location to be a practical solution for employment or athletic activities. Urban sprawl and the high cost of property in premium regions, on the other hand, may force people to relocate into the boonies (WUBoonies?) whether they like it or not. Rising sea levels, whether actual, as in places like New Jersey, for example, or anticipated, may also be swelling the migration to higher grounds. For identifying specific locations that may benefit from a comprehensive firewall system, and there are many, a good reference to start with is the Wildfire Hazard Potential map, developed by the U.S. Forest Service's Fire Modeling Institute to help inform assessments of wildfire risk or prioritization of fuels management needs across large landscapes, which map covers the entire United States. The map service displays those areas within the continental United States that have different levels of fire potential, categorized by five WHP classes of (very low – very high) and two non-WHP classes (non-burnable and water). Areas with higher WHP values represent fuels with a higher probability of experiencing torching, crowning, and other forms of extreme fire behavior under conducive weather conditions. According to the USFS, the data is not an explicit map of wildfire threat or risk; nor is it a forecast or outlook model for any particular season. When paired with spatial data depicting resources and assets such as communities, structures, or power lines, it can approximate relative wildfire risk to those resources and assets. It is instead intended for long-term strategic planning and fuels management. When planning urban developments with high or very high WHP levels, the cost of building concrete external firewall systems may be justified, if not demanded, just like the costs of water resources, water tanks, sanitation, streets, power utilities, extra fire hydrants and other fire protection resources, by the application of appropriate standards. Our infrastructure must adapt to modern threats and challenges, be they human-caused or natural, such as global warming and ecological instability. Are we sacrificially feeding dragons and sun gods with our precious resources, pets and very lives, in our pilgrimage to the mountain top? Very high WHP potentials may warrant firewalls with greater dimensions and other features and enhancements than those in merely high or moderate WHP areas, taking the threat of torching or crowning into consideration. Within high fire risk WUI areas and remote areas with the propensity to threaten WUI developments, practical and strategic logistics such as topography will inform architectural and engineering placements and designs for external firewall systems as discussed throughout this proposal. These placement options are enumerated in the following table arranged by topography which reveals the broad scope of this proposal. The ten items in this enumeration are not exclusive and will hopefully inspire additional adaptations and strategies as needed. The Fourth of July is the biggest day for wildfires, with 7,762 fires ignited on that date over the 21-year study period. Ironically, we celebrate Independence Day by threatening the same land we fought so hard to claim independently from England a couple hundred years ago. Balch and her study co-authors looked at 1.5 million wildfires from 1992 to 2012 and found that the human-ignited fire season was three times longer than the lightning-ignited fire season and also added an average of 40,000 wildfires per year. As a benefit of thinning the forests near WUI developments and other features of the proposed firewall system, we surmise that fires ignited near or in the occupied areas may have less of a chance to spread into the wildlands due to the reduction of fuel at the perimeter. By extrapolating data from the Balch study, we contend that most human-caused wildfires would fall into this space except for campfires at 5 percent and possibly a portion of deliberate arson at 21 percent. Although a dedicated arsonist may seek remote wildlands to secretly ignite a wildfire, we know that many arsonists are witnessed in the act of suspicious behavior near or within the WUI developments, locations that are convenient in well-traveled roads and trails. Incendiaries left behind also establish forensic evidence to pinpoint ignition locations. If we split the arson cases in half we get about 10 percent which adds up to 68 percent for all WUI located wildfire ignitions, perhaps a bit more for cases of natural lightning and such in the WUI. That totals to roughly 68-70 percent of all wildfires that we can manage and prevent within the WUI perimeter or adjacent to it with the proper tools and standards applied. Fires that start in the urban developments proper, including those at the hands of arsonists, may be hindered from spreading into the wildlands if the firewall structure intervenes, especially when enhanced with the bi-directional Superior Sprinkler System, described below. 3. Protect humans from occasional naturally-caused seasonal fires accounting for about 16 percent of all wildfires. The principal advantage of a firewall is the control of radiant heat including flaming fuels which will be physically blocked and possibly absorbed or reflected by the structure. Depending on the type of material, a thicker wall may potentially block or absorb more heat than a thinner wall. Firebreaks also contribute to such control by removing immediate fuels and generating neutral space where such radiant heat and flames will dissipate. A firewall can also obstruct the movement of firebrands at the level of the wall, whereas firebreaks offer no barriers to any particles carried by the wind. Adding the two together in parallel will potentially double their combined protective capacity in a summative manner or possibly they may interact in such a way to produce geometric results. Since these systems border the wildlands, and may extend for hundreds of meters, it’s also important to provide a bridge or porthole for wildlife to straddle or circumvent lengthy barriers. Although the proposed firewalls may not reduce the incidence of wildfires, the potential for substantially mitigating the number of acres burned and the losses related thereto are promising. Extreme winds and heat especially in the Western States require adaptive infrastructure solutions. According to a new climate change assessment for California: the average area burned by wildfires will increase 77 percent by 2100, and the frequency of extreme wildfires—those that burn more than 25,000 acres—will increase by nearly 50 percent under a scenario with high global greenhouse gas emissions. 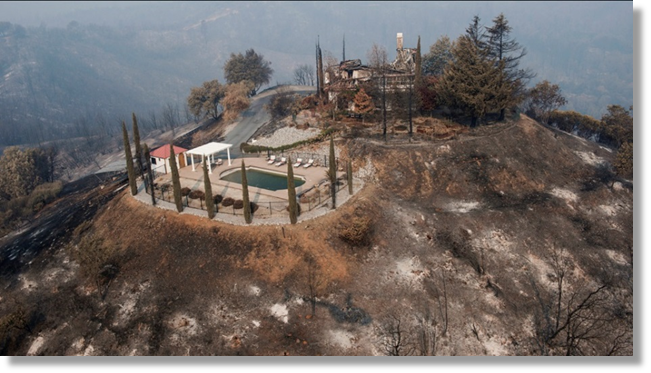 In the areas that have the highest fire risk, wildfire insurance is estimated to see costs rise by 18 percent by 2055. The external firewall system we propose is designed to guard against mountain waves and high pressure systems known as Diablo Winds and Santa Ana Winds along the Sierra Nevada, which historically drive many wildfires in California and are also addressed in the new assessment. These solutions also apply to a wide scope of topographical scenarios common to a range of ecological regions. 1. Heat: What sets this strategy apart from traditional firefighting tactics is the recognition that the vast majority of intense heat generated in a wildfire is not confined to the fire front, but is broadly distributed in large volumes of hellfire heat in vectors and wind streams widely extended in all three dimensions away from the fire front, and more so in wind-driven fires common to this climate. In many cases, dangerous heat also precedes and primes the vegetation to ignite the initial fuel source. The logistics proposed, for not just containing but also quenching these volatile heat vectors, center around key aspects of the firewall system, including the subterranean heat sink, horizontal heat flue, superior sprinkler system and wind turbine integration. The basic premise with regard to wildfire heat is that containment is not enough, and should only be recognized as a final protective perimeter. We need sufficient heat quenching and treated dispersal only into safe locations like subterranean heat pits, not spewing raw into the air to keep firebrands and dangerous fuels warm and cozy. 2. 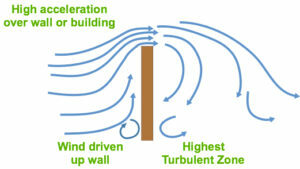 Wind: In addition to a sizeable wall structure with various reflecting surfaces, strategic preemptive solutions to mitigate dangerous winds that often prime the landscape for wildfire ignition, are designed with integrated firewalls and wind turbines on mountain crests and grassy plains. 3. Firebrands: Our focus on the hazards of firebrands includes tactics integrated with the firewall such as firebrand screens, water sprays and cooling the firebrand incubator as well as promoting innovatively repurposed wind turbines. We daringly extend this discussion to include possible mobile 3D heat containment tactics, as well. The objective: 3D comprehensive solutions, above and below the ground, for the big three threats of wildfires: heat, wind and firebrands. In the interest of data sharing, let’s also connect our superior sprinkler system information sensing and gathering process with Big Data systems in the Internet, from 3D to 3DC (3D Cloud) as well as multiple robotic nozzles with remote control capabilities. Though the solutions offered have the capacity to effectively manage the challenges of known climate extremes, they can also be calibrated for more temperate climates in various regions. Clearly, the wall would need to be fire resistant to the highest standards. The height of the wall is an important parameter that may be critical to functionality. Does a wall have to be 30 feet tall to protect against 30 foot flames? Rectitude, slant and curvature may also be strategically significant since an approaching fire usually accompanies or generates a great deal of wind and powerful plumes. For example, if the wall is intended to protect a housing development at the crest of a mountain of fuel below, should it lean towards the fuel? What if the wall and the development is at the base of the mountain. Should it lean the other way? A standard 6-ft. landscape wall provides a lever to catapult wind, flames and firebrands to the interior. It may help to protect against some predators, vermin, floods and bullets, but winds and wind-driven wildfires are only elevated and plummeted directly below in chaotic turbulence. As noted in ecolandscaping.org, wind also dries out soils and vegetation quickly. Additionally, wind increases plant transpiration, requiring the plant to use more water. High wind can shred plant leaves and sand particles can sandblast the entire plant. In agriculture, experts have learned to use semi-permeable vegetation screens and wind fences or windbreaks to at least mitigate the winds in a sustainable manner. Fire resistant wind fences are also available as discussed below. 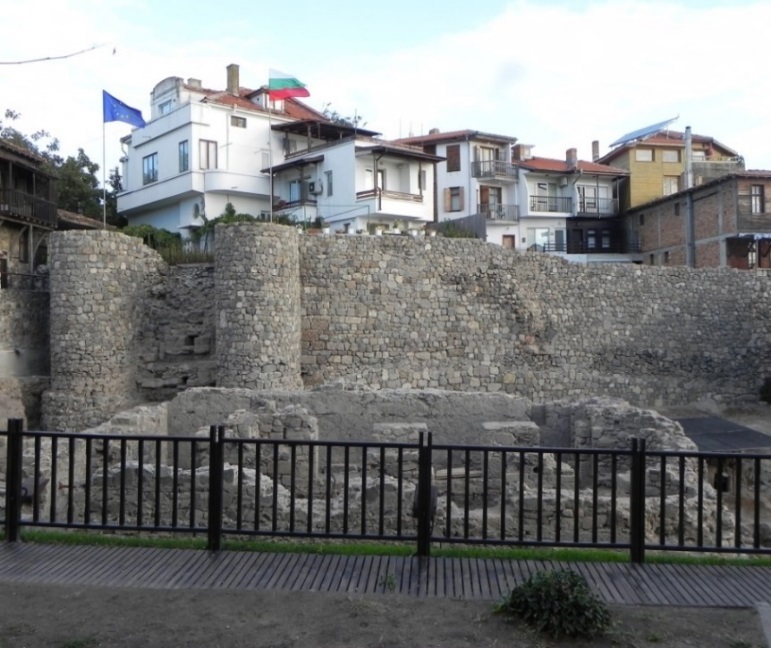 The idea of erecting large walls for protecting cities has been around for a while, as shown in this scene of fortress walls in the ancient town of Apollonia in Bulgaria. These fortresses were built to forestall invasions by enemy invaders. Now we anticipate firewalls to protect against the natural landscapes surrounding our urban developments which landscapes have unwittingly been transformed into an agent for wildfires mostly caused by humans, either deliberately or accidentally. We may get some interesting design ideas from the images of fortresses in our history books, as well. 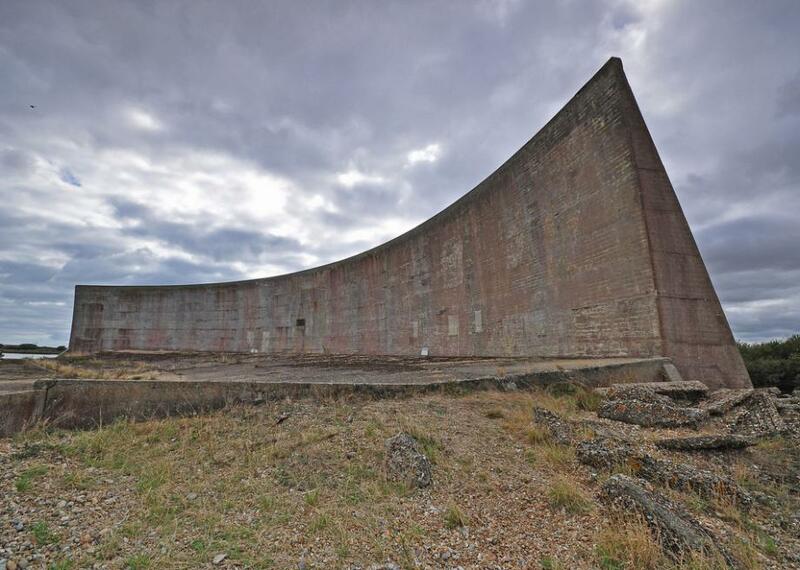 Before the inventions of radar and sonar, this behemoth was ingeniously designed as a sound mirror to detect invading aircraft off the coast of Great Britain, constructed between 1927 and 1930. The parabolic shape collected and magnified sound waves in the air over the English Channel and directed them at a microphone positioned just in front of the parabola. You can also use it as a hearing aid if you stand exactly in the right position. This 30-foot chunk of masonry might do as a super wildfire firewall, with a few refinements and the addition of the essential heat sink and heat flue. Here you will see some more practical archetypes we propose, as well. Today, we expect a little more from our public infrastructure. 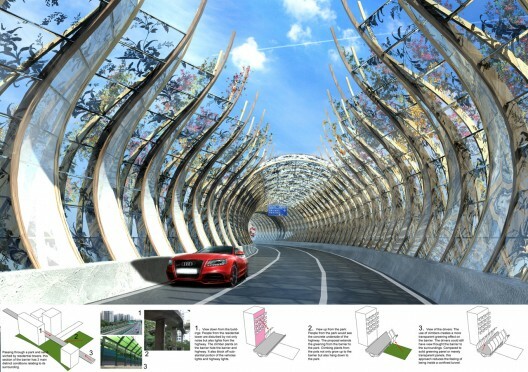 Instead of magnifying sound, this intriguing forest corridor serves as a sound barrier, and also generates electricity as passing vehicles wiggle adjacent panels. The pendulum system generates electricity from surrounding wind and turbulence from the passing traffic. Great design from BREAD Studio in Hong Kong, China. Our proposal to integrate external firewalls with wind turbines can also generate some electrical juice which will help pay for construction costs. 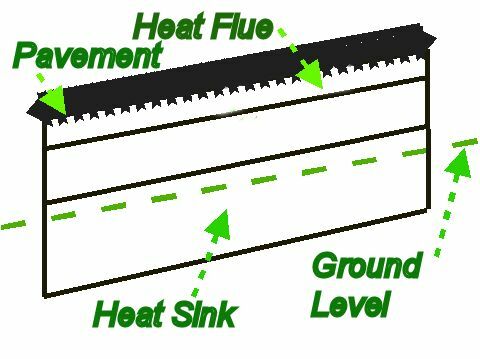 Blocking radiant heat is one thing, but if such heat is allowed to simply roll over the structure, as with a simple nonflammable barrier, and continue to flow in the same direction with almost the same intensity, how much protection will be provided? Firewalls within a building have at least a ceiling and roof or additional stories above them to seal off the flames and heat to some extent and contain them within the structure on one side of the wall. Not so with simple nonflammable barriers or walls out in the open. Instead of simply bouncing hot air and fumes into the open air stream above, would there be some advantage acquired by blocking their advance and reflecting them down into the earth in a subterranean heat sink where more heat and fumes can safely be absorbed below the ground, along with possibly a few firebrands? Whereas the concrete wall structure itself is capable of absorbing some heat and reflecting other heat, the ground below is practically unlimited in heat absorbing capacity and only a couple of shovels away. The same trench needed for the foundation can simply be enlarged to afford ample space for some hot air to bounce around and cool off before it is allowed to safely flow back into the space above through filtered vents, which filters may help to capture firebrands and other debris. Possibly, the exhaust vents will be elevated in the wall structure and directed towards the wildlands, where, again the cooling air and fumes may be recycled in the same draft as they mix with warmer air straight from the fire front. The cross-section schematic is presented only to give a very rough visual presentation of the ideas described as the subterranean heat sink and the horizontal heat flue and how they may be positioned relative to the entire structure. These are the guts of the system with regard to heat and fire control and disposition: digesting heat and wind and converting some to useful kinetic energy while dispersing and absorbing other streams into the cooler walls, reflectors and air spaces within the bowels of the heat sink below and vents of the heat flues above. And much of it recycled in the process, by design, and mixed with cooler air along the way until finally being filtered, twisted and belched via the superior exhaust vent. 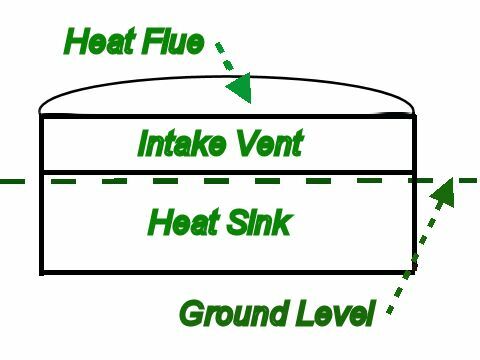 The heat flue draws hot air and flames through the overhang at a slight incline and at a 90 degree deflection from its entry point to the left of this schematic. 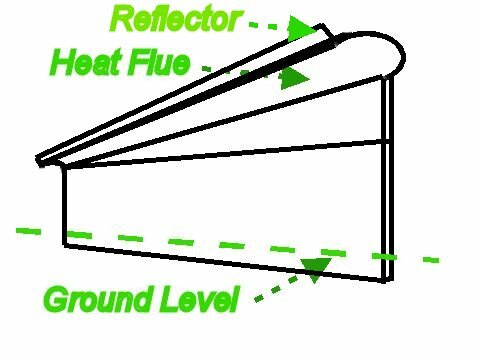 Internal reflectors redirect incoming wind-driven hot air streams down into the heat sink where they will lose a few calories before bouncing around and exiting through the same heat flue. This system is designed to protect residential properties on the right side of the wall structure as presented above, based on the orientation of the heat sink intake system. If the fire is advancing from the residential side of the wall, the main protection for the wildlands would be the Superior Sprinkler System and the coordinated thinning and firebreaks discussed below. For maximum protection in both directions two similar structures facing opposite ways could be designed to share a common subterranean heat sink with a V-shaped profile. Also, for fire fronts descending on a hillside, variations in the overhang could be made to extend it at a higher angle and longer distance. It’s all a matter of simple geometry and heat dynamics, and, of course, specialized engineering skills for dealing with the details. Extending the hood several feet ahead of the structure as an overhang will capture more heat and flames that may not have the advantage of collateral winds. Since these heat vectors will be mostly directed in an upward direction due to heat dynamics, this strategy would be critical for capturing heat and flames advancing on a hillside, for example. Shaping the hood with an additional bend or advanced wind reflector may allow for effectively guiding approaching flames and heat either towards the heat sink or laterally along the hooded flue depending on the approaching direction and intensity of the advancing flames and wind. 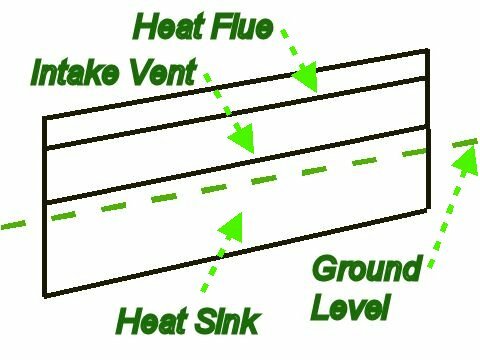 In general, it is likely that most wind-driven heat will be absorbed by the heat sink whereas other heat that is lofted simply by heat dynamics would be re-routed through the heat flue system. Naturally, hot air and flames tend to soar vertically into the air while connecting with fuel sources on the ground. Here we shape the contour of the firewall to guide the horizontal vectors into an optimal downward path to their final resting place, in terms of their caloric content. The only energy we need is the kinetic forces already provided by the advancing wildfire. Of course, taller walls will have more capacity to tag more hot air streams and firebrands to redirect them down below. Fuel driven flames advancing in a declining direction on a hillside, to the right of the above schematic drawing, can be adequately contained by the substantial back side of the wall structure, without the benefit of a heat sink, while their remaining fuel is exhausted and their residual heat dissipated vertically in the air. Because of the substantial fuel break imposed by the firewall structure and most likely a parallel firebreak or road, there would be very little likelihood that the declining front would be able to jump over the barrier. Even a small amount of downward wind or eddies caused by the mountain wave effect may be sufficiently neutralized. The back side of the wall will also deflect declining winds and heat above and away from the hillside for more protection. For ideal hillside installations in windy terrains, the back side of the structure could also be designed with an additional barricade several meters in height for more protection in the vertical direction. The overhanging heat flue structure on the downside left and the vertical barricade on the upside right would combine to form a V-shaped profile above the ground. Ultimately, the upside could simply mirror the downside, flues and all, and share a common heat sink. Maximum protection in all terrains. 1) Level plane - Elliptical top with heat flue occupying the arched space. Foundation flat on level plane or nearly level. Exhaust vent at highest point of the ellipse near center. 2) Level plane - Geometric top shaped like an isosceles triangle over the intake vent and foundation as the base. Foundation level on fairly level plane. 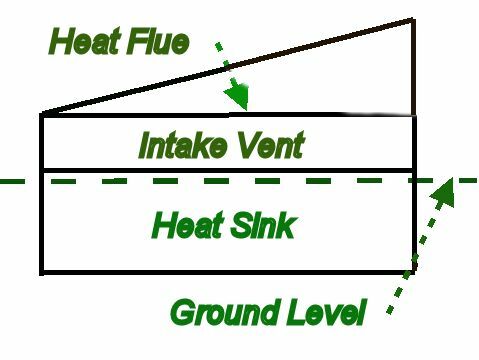 Heat flue occupying entire triangular space. Exhaust vent at highest end of heat flue. 3) Level plane - straight inclined top (not curved) shaped like a right triangle over the intake vent and foundation as the base. Foundation level on fairly level plane. 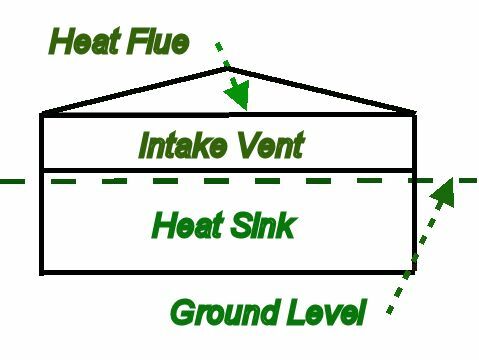 Heat flue occupying entire triangular space. Exhaust vent at highest end of heat flue. 4) Inclined plane - roadway aligned top following the inclination of a roadway or firebreak on a hillside plane with foundation also so inclined. Exhaust vent at top end. 5) Inclined plane - Roadway integrated structure follows roadway inclination and constructs firewall directly below roadway to rebuild road as top layer of firewall. Provides opportunity to expand roadway. 6) Barebones – No heat sink for terrains where heat sink not practical or for small individual lots. Flue base is inclined above a level wall. Exhaust vent at high point of flue. Reflector bounces more heat and flames into the heat flue. uninterrupted space in order to absorb and extinguish more heat. One ultimate heat flue exhaust vent at the highest point would be the ideal architecture, however multiple exhaust vents may be the only practical solution for some situations. 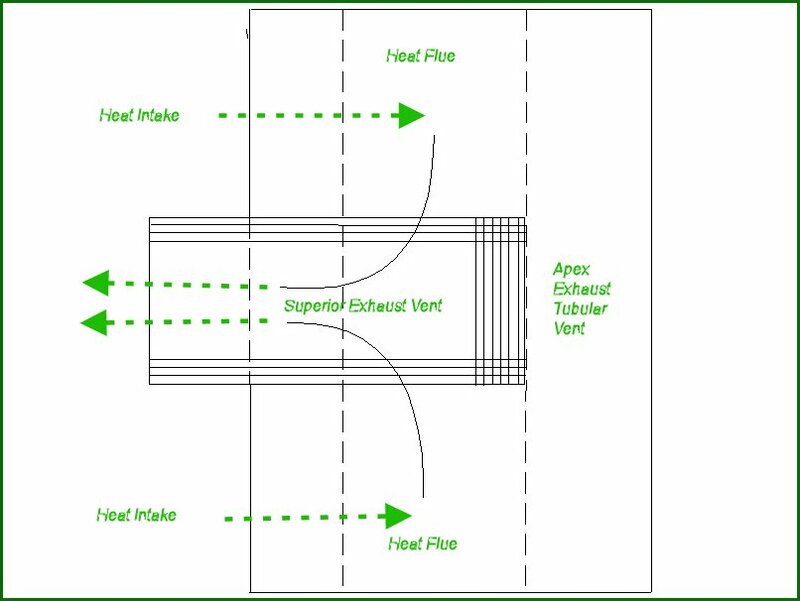 By applying the same principles of 1) inclining the heat flue ceiling, and 2) placing the heat flue exhaust vent at the highest point available, many functional variations, combinations and alternatives may be designed, as well. Wherever you can build a path or firebreak, by digging a little deeper, you can also build a super-protective firewall. Even without a heat sink, a firewall with only an ample heat flue can increase your chances of surviving an advancing wildfire to a considerable degree. A few robotic nozzles will improve your chances even more, as discussed in minimum firewall configuration. A convenient path of construction may be similar to an access road that gently wraps around a hillside with minimum degrees of incline. Such hillside access roads may also be suitable placements for external firewall systems as we propose. The overhanging hood will function as a heat flue with an open bottom channeling the fire and fumes laterally for possibly several hundred feet, or even more if it is tucked beside the entire length of a hillside access road, for example. The greater the length, the greater the volume of uninterrupted cubic space and linear surface area both in the heat flue and heat sink. By extending the heat flue system to the very top of the hillside with only one ultimate vent at the crest and above any housing or vegetation, the exhausted air will be positioned in most likely the safest space possible since vulnerable fuels will be below their trajectory. This may be seen as a virtual chimney or smoke stack which belches out heat and smoke in a safe manner. In some cases, where the landscape does not provide a suitable elevation for a safe firewall flue, a physical smoke stack can be integrated for added safety. Winding hillside access roads may also be integrated with external firewalls in one solid structure. Please see Roadway Integration for more discussion on this topic. The dynamics of rising heat will serve to trap most of the heat and flames within the hood. The extended flue along the road may capture more of the heat that would not otherwise be successfully redirected towards the subterranean heat sink and will likewise re-channel those fumes released through the heat sink exhaust vents. Please see schematic rendering above for Apex Exhaust Vent. 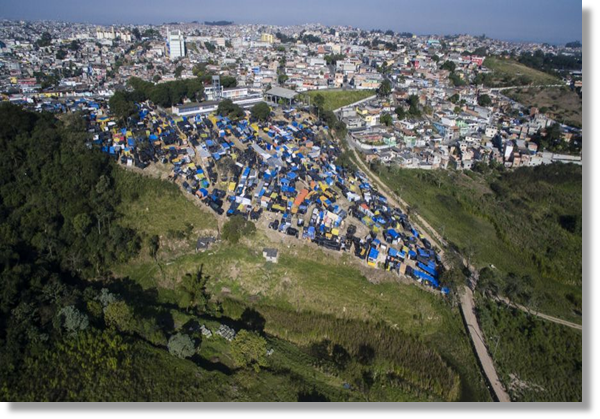 Figure 4 Shacks with tarp roofs dot the hillside of MTST’s Paulo Freire Occupation on the outskirts of São Paulo. Image by The Megacity Initiative. Brazil, 2015. Some of the roads surrounding this development and shanty town may be suitable for the proposed solution of a comprehensive firewall system tucked below the road. This particular site is in São Paulo, Brazil where there’s a demand for affordable housing. The firewall system can also be constructed on any slope or plain without the convenience of a road or firebreak with which to merge, such as in the foreground of this photo. In some parts of the world, hillside housing is more affordable, in others, it comes at a premium. Homeless squatters need protection, too! Location, Location, Location. Wildlands, Housing, Wildlands, WUBoonies, Tent Cities, People. In addition to the option of building firewalls adjacent to winding access roads, the roadway itself may be integrated with the firewall and extend over the top. This may be necessary in hillsides with steep cliffs, for example, which is where more intense fires are likely to occur. The added weight of the roadway may require pillars extending from the base to the overhanging hood and superior roadway. Occasionally, roadways along steep cliffs may already have supporting pillars in their foundation. The integrated roadway-firewall may also accommodate an expansion of the roadway. Expanding the roadway in this manner will more readily facilitate the passage of emergency vehicles, which is often problematic in hillside emergencies. On some steep hillsides, it may be necessary to forego the heat sink integration due to the engineering challenges involved, although this omission should be avoided unless absolutely necessary. In those sections without a heat sink, the protection provided by the extended overhang and heat flue system, as well as the sprinkler system with properly spaced robotic nozzles, should reduce the threat of advancing fires to a significant degree. Positioning the wall below the road will also serve to protect the road and its travelers, assuming the fire approaches from below. This may be critical for protection during an evacuation, for example. See Hillside Housing for an example of suitable hillside roadways. On a level plane, such as at the base of a hill, crest of a mountain or in a plain, the same inclined flue effect may be accomplished simply by slanting and inclining the flue profile in the shape of an isosceles triangle or right triangle in the desired direction or forming an elliptical design with an arched heat flue. In any case, at the crest of the inclined structure, the hood will be reshaped and extended outward from the wall towards the flaming front. 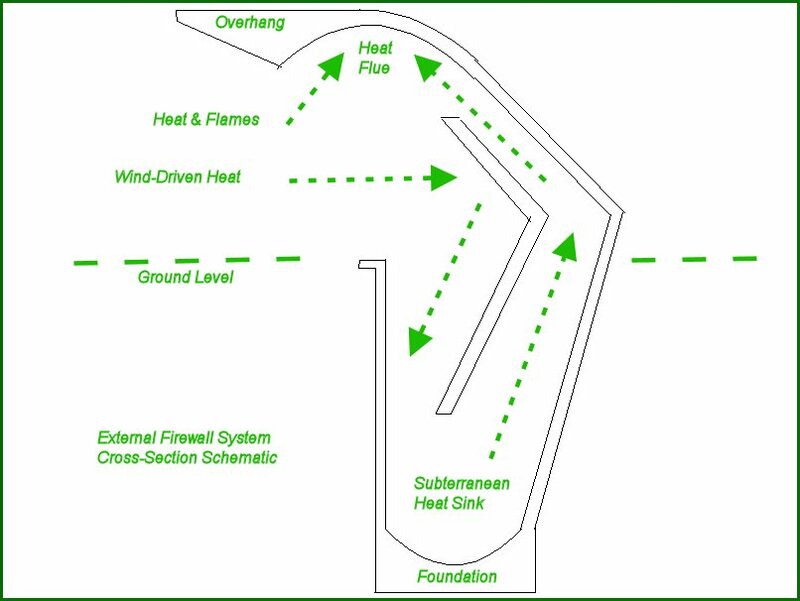 A mountain crest firewall on a level ridge may have an elliptically shaped top forming the heat flue as depicted in the above schematic rendering. The entire width from this perspective may range from 100 to 500 meters or more. More length and height, as well as depth in the subterranean heat sink below ground, increases the cooling capacity proportionally. The height of the firewall above ground may range from 5 to 10 meters. The exhaust vent at the central apex flushes out cooler air in the opposite direction of the intake vents. Components include the superior sprinkler system with multiple robotic nozzles and remote control capabilities and surveillance system with thermal imaging, RGB and heat sensors. Connectivity with HPWREN and other emergency networks are anticipated. Additionally, firebrand screens will be included in the exhaust vents and exterior positions. This is the answer to the question of the irresistible wildfire force coming up against an unsurmountable firewall. It is also a preemptive means of reducing the vacuum effect of the mountain wave that causes havoc down below and either helps to initiate new fires or supports the advance of existing fires. Thus, it will be at work, shaping wind and cooling air, year round, as well as providing remote views of the landscape for all to see.